Links International Journal of Socialist Renewal has published several views from the left on developments in Ukraine HERE. For more by Boris Kagarlitsky, click HERE. May 3, 2014 – Links International Journal of Socialist Renewal -- The preliminary outcome of the revolt in south-eastern Ukraine can be described as an unstable equilibrium. 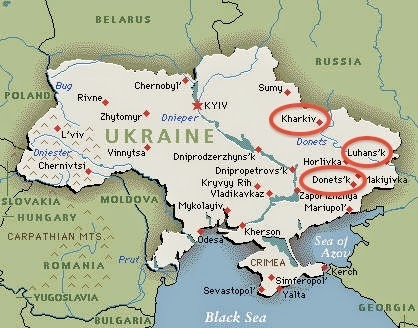 Attempting to crush the Donetsk republic with the help of their armed forces, the Kiev authorities have met with defeat. The army, as expected, has refused steadfastly to wage war on its own people, and the forces of the Right Sector and National Guard have clearly been insufficient to cope even with the militia, not to speak of the mass of protestors. There is no basis, however, for speaking as yet of victory for the Donetsk Peoples Republic. While Kiev’s “maximum plan” has consisted of quickly restoring control over Donetsk and Lugansk, its “minimum plan” has rested on restricting the open insurgency to these two provinces. It is this minimum plan which, however ineptly, is being implemented. The militia members succeed from time to time in seizing new buildings or in raising the republic’s flag over new populated areas. These small victories raise the spirits of the resistance and in a minor way improve its tactical situation, but do not create the conditions for a strategic breakthrough. The Donetsk and Lugansk activists would do well to recall Lenin’s much-cited formula to the effect that “defence is the ruination of a revolt.” Their actions, however, are based on a particular view of the situation, a view that is organically present not only in the movement’s leaders, but above all in a substantial section of the masses in the Ukrainian south-east. The insurgents are convinced that all they need to do is to hold out for a certain time, and Russia will then come to their aid; if this does not take the form of direct military intervention, some other mechanism will be found. Unfortunately, every passing day since the beginning of the revolt has shown how illusory these hopes are. In the thinking of the activists of Ukraine’s “Russian Spring” there is no particular gap between the Russian authorities, the Russian elite and society in general; the latter is perceived as completely uniform apart from a small number of liberal oppositionists, isolated within their own country. It is striking that while these activists have an excellent grasp of the contradictory nature of the political and social order within the Ukrainian state, they fail to see the identical contradictions in the fraternal country. South-eastern Ukraine, meanwhile, has become an obvious hostage to these contradictions. Official Moscow lacks both the desire and the resolve to resort to active intervention. The maximum program of the Moscow leaders consists of holding onto Crimea, and the patriotic slogans about Slavic brotherhood are of value primarily as a tool of internal propaganda. In no way do they represent a strategy for the foreign policy of a state whose elite survives by selling the country’s national resources to the West. Of course, the Russian oligarchs would be agreeable to taking the enterprises and resources of the Ukrainian south-east under their control. But for the present, the price of this undertaking (both political and directly financial) and the associated risks are too high, and most importantly, are increasing day by day. Even if a section of the Russian elite harbours such plans and ambitions, these have now clearly been postponed. In any case, the people who make up the Russian leadership are not politicians but bureaucrats and public relations specialists, people who simply do not have either the experience or the inclination to make risky decisions that radically alter the situation. None of these people can even imagine how they would need to act under the conditions of massive crises and revolutions. The Crimean leaders seized the initiative, and in practice, forced Moscow to agree both to the forms and also to the rapid tempo of integration, leaving the Russian bureaucrats not only without alternatives, but also without time for reflection. The situation is different in the remaining provinces of the Ukrainian south-east. Representatives of the Donetsk republic and of the movements of the Ukrainian south-east show up constantly in Moscow, where they are received warmly and with goodwill. Meetings for them are organised with journalists and Duma deputies. Then they are sent home empty-handed. The individuals through whom official Moscow expresses its support for the “brother people” do not decide anything, and do not even take part in discussions on important questions. They are simply used to transmit propagandist formulae, and do not shape the political agenda. Moscow cannot, of course, publicly cut off its support for the Donetsk republic. That would be a disaster in terms of domestic politics and propaganda, and the potential for disaster will be greater to the degree that today’s Russian authorities manage to build up their ratings in the course of the Ukrainian turmoil. If the revolt is smashed while Russia does nothing, the effect will automatically be to provoke mass indignation. The problem, however, lies in the fact that it is impossible to calculate everything in advance. As they try to manoeuvre and win time, the Russian authorities risk missing the crucial strategic moment when the situation flies out of control, and they are forced simply to reconcile themselves to the outcome whatever that might be. The paradox lies in the fact that this strategic turning point will not necessarily result from some initiative by Kiev. As the rebels try to ensure that the strategic initiative finishes up in their hands, they cannot afford simply to wait for decisions by the Kremlin. To the contrary, they need to create a new situation through their own actions, determining in advance what these decisions will be. A breakthrough in the development of the struggle in south-eastern Ukraine will only occur when the largest regional centres, above all Kharkov and Odessa, join in the movement. Clearly, the authorities in Kiev understand this perfectly, since they are using all available means to try to maintain their control over these regions and to seal them off from the Donetsk republic. The experience of the past few days has shown that for mass protests to develop in these centres, the slogans of brotherhood with Russia and of defending the Russian language will be completely inadequate on their own. A broadening of the social base of the uprising will depend on its program, on the goals and slogans that it advances. Against the background of an inexorably worsening economic situation, only demands aimed at satisfying the urgent needs of the masses can serve to mobilise the huge numbers of people who now sympathise with the rebel republic, but who are not ready to stand beneath its banner. In conditions of revolutionary crisis, moderation ceases to be a pragmatic virtue. To the contrary, it turns out to be suicidal. The more moderate the leaders of the Donetsk and Lugansk republic now show themselves to be, the fewer hopes they have of drawing into struggle new masses of people outside the borders of their regions. Needless to say, such actions are liable to alarm the Moscow bureaucrats who keep a constant watch over the interests of “their own” oligarchs. But as noted earlier, it is precisely the Moscow politicians who have now finished up hostages of the Ukrainian situation. If the revolt shifts to a more radical course, the authorities in Moscow will be forced to beat their breasts and voice their approval. In the same way, they were obliged in the case of Latin America to come to terms with Hugo Chavez, even though the social measures being implemented in Venezuela caused them no particular delight. The activists and leaders of the Donetsk republic will soon have to decide – whether to perish while keeping their eyes fixed on Moscow, or to have a chance of victory through basing themselves on the social interests of their own population. They still have time to make this choice. But as each day passes, this time is running out.